Ask ten different successful organic farmers to name what they think the ten most important skills or attributes for new organic farmers are, and you're sure to get dozens of different answers. Everyone has a different opinion. Also, the skills and attributes you'll really need will vary widely depending on the type of farming you're doing. 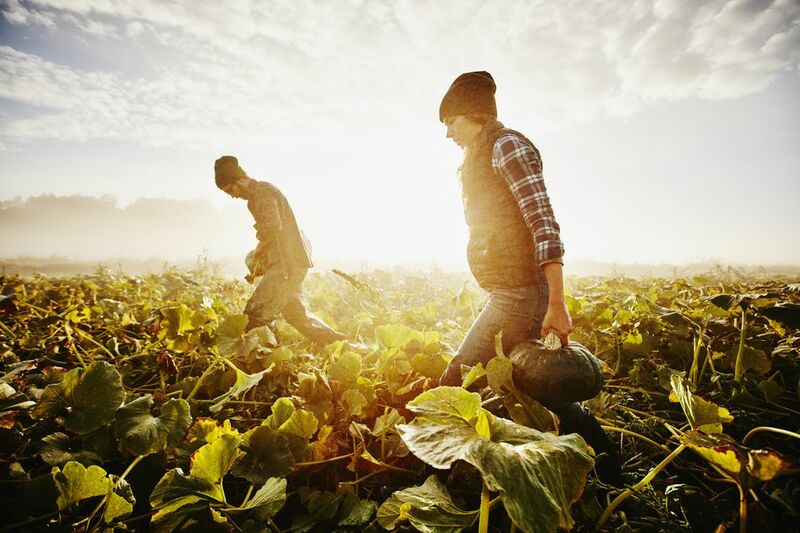 Opinions aside, if you're considering organic farming as a career, there are some key skills and attributes that are maybe more important than others. If you're missing one of the key skill below, no worries. This doesn't mean you'll never be a farmer. It simply means you should think about how you can improve your skills or attributes in a particular area. Farmers spend long days standing, lifting, pulling and on-the-go, moving quickly from one task to the next. Some days you may spend all your time moving while other days you'll spend hours sitting in a truck driving crops from city to city. Those days of sitting, while maybe a nice rest, can still wreak havoc on your body. On top of farming tasks being extremely strenuous, they're often done in varying conditions such as intense heat, cold and rain that add to the stress. Plus, most farmers work insanely long hours and take few days off. All in all, being as healthy as you can is important. If you're engaged in unhealthy habits such having a poor diet, staying up all night, or drinking to excess, your body won't easily handle the added stress of farming. Make sure you're healthy going into this career. If you never balance your checkbook and can't locate your health insurance paperwork, organic farming will come as a crazy shock to your unorganized system. Farmers and especially organic farmers must keep all kinds of records accurately and regularly. From invoices to certification paperwork to warranties to taxes to labor contracts to payroll, you're going to have all kinds of paperwork to keep organized. Misplacing files isn't an option for organic farmers as it could lose you your certification. Later on, if organizing is getting to you, you can hire someone to do it for you, or at the very least invest in some good software. However, in the beginning, there's a good chance you'll be handling the paperwork, so it's best to learn how to get organized now. If you don't have organic integrity, then you really shouldn't get into organic farming. There are plenty of other jobs out there, and even lots of farming jobs you can do that don't involve being an organic advocate. You should be entirely on board with organics, not just kind of lukewarm about it. Having organic integrity allows you to maintain organic certification, discuss organics better with customers, and maintain the industry as a whole. Growing crops and caring for livestock are important skills for sure. However, all profitable organic farmers also need business skills that go beyond practical farming skills. As an organic farmer, you'll be dealing with banks and other financial issues, working with buyers and sellers, dealing with marketing and promotions and much more. Interpersonal skills are a big deal for most business owners, including farmers. In fact, organic farmers have to work even harder than regular farmers on interpersonal skills because not all consumers know about organics. On top of that you'll work with, and need to communicate with other farmers, ranchers, agricultural managers, certification agents, laborers, buyers and more. To thrive, you'll need effective communication skills, the ability to debate nicely (organics can be a hot topic) and a willingness to be around people. If pursuing lifelong education and new experiences isn't something you're interested in, then farming may not be for you. Organic farmers can always learn new skills and update current skills. Learning can take many forms. Many farmers, ranchers, and agricultural managers train under more experienced farmers, but college training is becoming a norm as well. Universities offer plenty of opportunities to learn as do government projects, such as Beginner Farmer and Rancher Developer Program. Apprenticeships, books, conferences, classes, keeping current on organic trends, workshops and learning by doing are all great ways to stay fresh and remain knowledgeable, even as times change. Almost anyone can learn how to grow crops or manage livestock, but good analytical skills are the difference between simply going through the motions and thinking issues through and doing tasks well. For example, in the ever-changing landscape of farming (literally and figuratively), an organic farmer will use comprehensive skills to monitor and assess the quality of their land, crops or livestock and to solve problems as they arise. As a farmer, you often must think on the fly, so great critical thinking skills are also key. For example, can you think your way around tough weather conditions appropriately? Excellent analytical and critical thinking skills will allow you to analyze the toughest situations, gather new information and formulate a plan that may be outside of the box. You won't be able to solve every organic farm problem with a textbook. Although mechanical knowledge isn't entirely necessary for organic farmers, learning to become more mechanical minded is extremely useful and can save you money and time. Most farmers need some machine operation skills and especially those who are working on smaller farms where there's not always someone else around to fix or operate complex machinery. Additionally, most farmers should take the time to learn about how to complete occasional routine maintenance on basic farm machinery. No matter how crazy it gets, a cool head and the ability to think and work under pressure are important. It is true of any successful worker or business owner, but as an organic farmer, you'll not only face changing climates and long days but pressure from both the conventional and organic sides of the agriculture industry. If you can learn early on how to stay chill when the going gets rough, your mental and physical health will fare better in the long run.